What is a Pet Care Center? The concept of the Pet Care Centers is a trend that is growing around the country. There are over 1,000 Pet Care Centers in the United States. Morgan's Paws Pet Care Center, LLC gives dog owners an alternative to leaving their dogs home alone while they are working. It's also a great place for your dog when the maintenance person, pest control person or cleaning person pays a visit to your home. At Morgan's Paws Pet Care Center, LLC your dog will play with other dogs in a supervised setting during daycare. During their stay, there is naptime, cuddle time, treats and tons of fun! Every dog in our care is pampered and watched to ensure their individual needs are fulfilled. 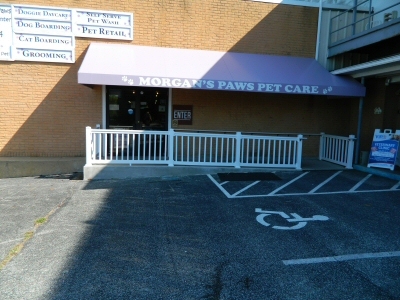 At Morgan's Paws Pet Care Center, LLC your dog will NOT be kept in a kennel all day if they attend daycare. Your dog is free to roam around our 5,000 sq ft. big dog room or 4,000 sq. ft. small dog room facility or just lounge around. Whatever their little hearts desire. We also have a great fenced in courtyard with lots of room for your dog to run around or just hang out and catch some rays.